According to a study published in Stroke, A Journal of the American Heart Association, severely impaired stroke survivors could walk better when a robotic assist system was added to conventional rehabilitation. Italian researchers evaluated two-year mobility outcomes in 48 stroke survivors who had been discharged from a hospital and were unable to walk at the study's start. Half underwent conventional overground gait rehabilitation and half had conventional rehab plus electromechanical robotic gait training for several months. "After two years, five times more patients who underwent robotic assistance training were able to walk without assistance, but only the most severely impaired," said Giovanni Morone, M.D., lead researcher and a physiatrist specialist and temporary assistant professor at the Santa Lucia Foundation, Institute for Research Hospitalization and Health Care in Rome. "In others it seemed to make little difference, so the patient selection for this type of treatment is most important." Earlier studies have shown similar advantages combining robotic and conventional therapy early on, but this is the first study to examine whether or not these improvements persist. The robotic devices are electromechanical platforms attached to a patient's feet that are controlled by a physical therapist. The therapist uses a controller to carefully measure a patient's status and to progressively set bearing weight and their walking pace. In the new study, patients were evaluated during their hospital stay, at discharge, and two years later. They were classified by the degree of their disability, and separated into either high- or low- mobility groups. The team used three standard tests to evaluate patients' ability to walk and other task performance, including normal daily activities. During treatment, all patients underwent two therapy sessions each day for five days per week for three months. The robotic gait assistance group also had 20 sessions of robotic gait training during the first month along with abbreviated conventional therapy for the extended period. Only patients with the greatest degree of motor impairment who underwent robotic training showed improvement in walking without assistance two years after their discharge. Although other studies have found robotic assistance can help improve patients for six months, larger trials in patients who could still walk have found that training with either robotic assistance devices or body-weight supported treadmill training are not superior to having patients walk outdoors, and may even be less effective. "It could be time to change the research question from whether or not robotic-assisted walking training is effective, to who will benefit the most," said Morone. "Doctors need to select the right patients and remember that this is an adjunct to traditional gait training." Future studies should attempt to more finely correlate these treatment options with the degree of motor impairment, as well as the stroke post-onset timeline for recovery, he added. Article:American Heart Association. 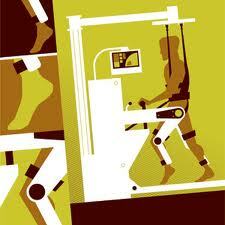 "Immobilized Stroke Survivors Benefit From Robotic Therapy." Medical News Today. MediLexicon, Intl., 19 Dec. 2011. Web.